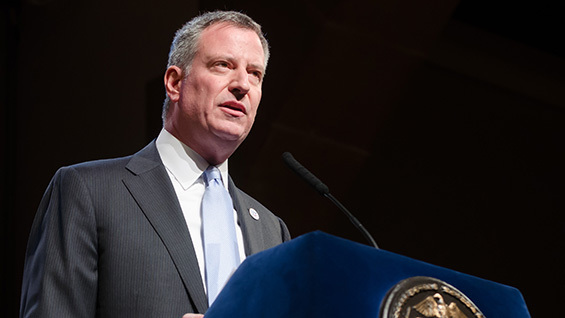 Taking his place among a 150 year history of civic leaders before him, New York City Mayor Bill de Blasio delivered an address in the Great Hall of The Cooper Union on Thursday. Entitled, "On New York City's Future,” it commemorated his first 100 days in office. 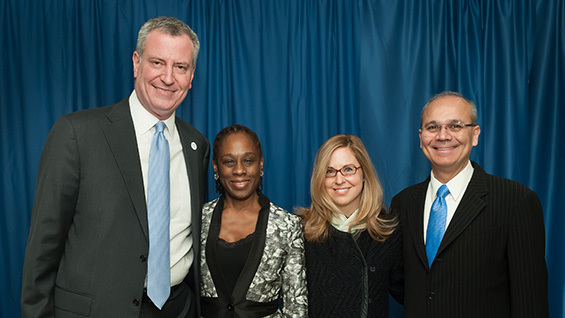 Prior to the event President Jamshed Bharucha, trustees and deans of The Cooper Union greeted the mayor and his wife, Chirlane McCray, backstage. Shortly after noon President Bharucha appeared before a full house of state and local leaders, New York City staffers, assorted guests and members of the media to formally welcome the mayor and all those assembled. President Bharucha paid tribute to the long history of the Great Hall as a forum for civic discourse as well as progressive leaders and movements. "The Great Hall has hosted Frederick Douglass, Elizabeth Cady Stanton, Native American chiefs, Heads of State, Nobel laureates, and the launching of historic social movements including the Red Cross and the NAACP," he said. "It is in that same spirit of public discourse that we are gathered here today – to discuss the future of our great New York City." Mayor de Blasio took up the theme of the history of the hall in his opening and noted The Cooper Union as an "extraordinary New York treasure," thanking the faculty, workers and students, "who make this place one of the great institutions of this city." "It is a particular honor to be here because this stage is renowned for over a century and a half for being one of the places that New Yorkers come together to think, to talk, to dream," the mayor said. "And it’s part of an institution that’s always had the highest academic standards but has always believed in inclusion. It’s believed that everyone deserves an opportunity for the extraordinary education afforded here." "You heard from the president, this is a stage where scientists and artists and presidents and mayors have spoken," Mayor de Blasio said. "And they’ve spoken to passionate souls and curious minds over the generations – people seeking truth and people trying to make sense of the times they live in and where we go from here. So we find ourselves in a perfect setting to discuss all that our city is and all that we’re capable of when we’re at our very best."